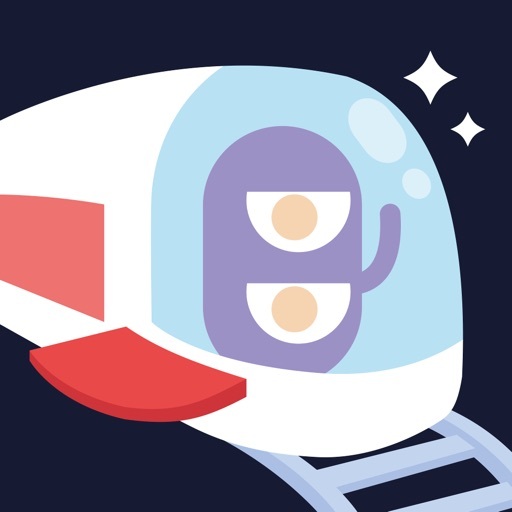 Cosmic Express ($4.99) by Draknek Limited is a puzzle game about building train routes for an awkward space colony of adorable little aliens. 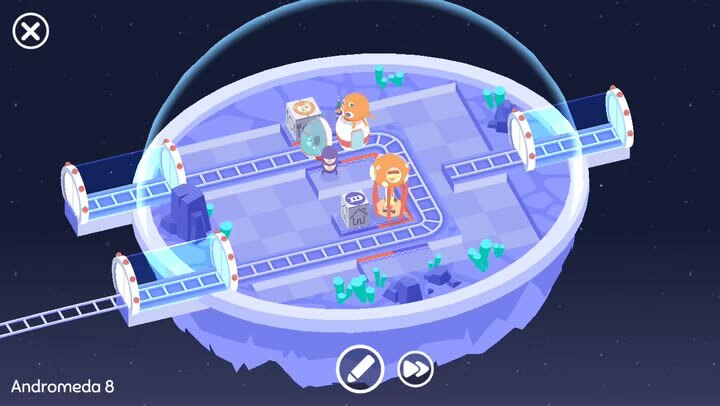 If you enjoyed titles like Mini Metro and Conduct THIS!, then Cosmic Express is another fine gem to add to your collection of train puzzlers. When I’m not exploring Hyrule on my Nintendo Switch these days, I like to take a breather and relax with some quick game time on my iPhone. If you’ve followed my work over the past few years, then you’ll know that I’m a complete sucker for puzzle games because while I like to relax, I prefer to keep my brain stimulated somehow, and I find puzzles to be the best medicine. When Mini Metro came out, I quickly fell in love with the train puzzle genre because not only am I a fan of trains in general, but I love the complexity behind them — they look easy at first, but there’s much more to trains and subways than what you see on the surface. 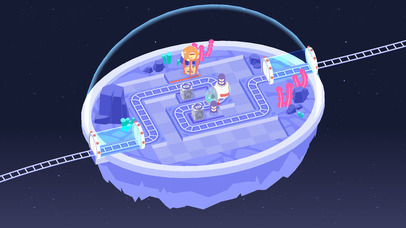 Cosmic Express caught my eye on the App Store in the past few days because of the cute aliens, but I also noticed that it was from the same developers of A Good Snowman Is Hard To Build, which was another delightful puzzle game. Because of this fact, I knew Cosmic Express was a game that I had to check out, and I can definitely say that I’m not disappointed. 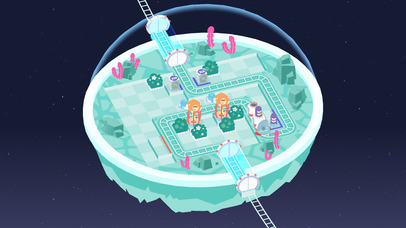 Visually speaking, Cosmic Express is gorgeous and packed with a ton of charm. The game is rendered in 3-D with an isometric perspective, which is great because it helps players see the entire grid where they’ll be laying train tracks on to solve the puzzles. It looks a bit more cartoonish than the other train games I’ve mentioned earlier, but that’s just part of the allure of Cosmic Express. The color palette features a nice range of soft and vibrant pastel hues, and everything contrasts nicely with one another, so it’s easy to tell things apart. The alien creatures have a distinctive skin color and appearance, all of which I found to be rather endearing, and it’s not hard to tell what their destinations are. Animations are smooth and fluid, so I had no issues with lag on my iPhone 7. There is a subtle, ambient soundtrack in the background and there are fun and quirky sound effects that you’ll hear as you have your space train kick into motion. I believe that Draknek Limited did another excellent job in terms of the visual and audio design with Cosmic Express. 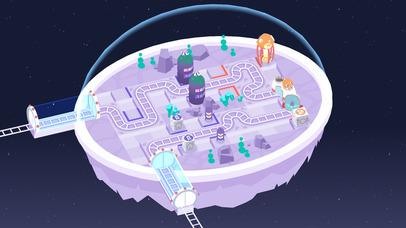 Like other puzzle games before it, Cosmic Express is level-based, and players have to complete previous puzzles in order to unlock access to the next stage. While it’s fairly linear, it does give a bit of leeway as you progress, because some stages branch off to open up later levels early. While I’m not sure how many levels there are in total, the App Store description mentions “hundreds of levels,” so you can be sure that there is plenty of bang for your buck. 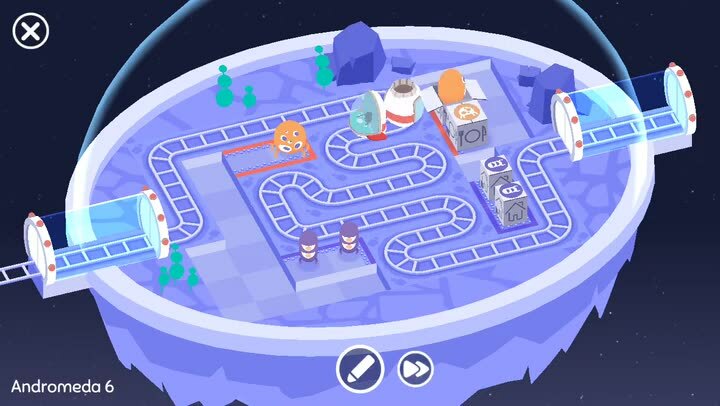 Cosmic Express is also pretty relaxing, as there are no points or stars to worry about collecting — the goal is to just get all of the aliens in the space colony to their proper destinations, and then have the train exit to move on to the next area. It sounds simple enough, right? As you advance through the stages one-by-one, you’ll soon realize that even such a basic concept gets intricate and complex. Controls in Cosmic Express are straightforward, intuitive, and work well even on smaller screen devices. 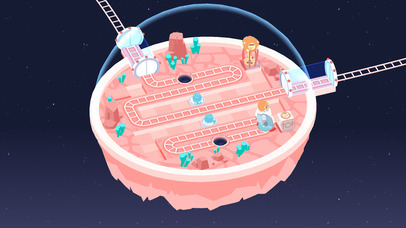 The start of the track will usually be on the left side of the colony bubble, and your job is to place tracks down on the grid so that it picks up each alien as a passenger, drops them off at their appropriate destination (color coded), repeats the process for each alien, and then goes to the exit, which is located on one of the other sides of the grid. To place tracks down, just touch-and-drag from either the start or end point of the track. 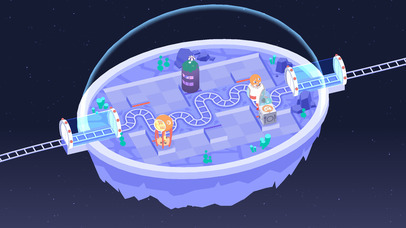 Tracks cannot cross over each other, so the trick is to figure out a path that will pick up all aliens (one-at-a-time) and drop them off and then reach the exit in one go. Once you have all of your track laid out, just tap on the “Play” button to have the train move. If the train is unsuccessful, then you can tap on the “restart” button to try again. Since there are no points, stars, or penalties to worry about, Cosmic Express is a rather meditative game, making it a perfect way to relax. I’ve only managed to play through some of the beginning levels, but so far the game is thoroughly enjoyable. I love adorable graphical style, the audio is a delight to the ears, controls work well (even on small screens), and the puzzles themselves can be fairly challenging, despite the cartoonish aesthetic. I’m still in the early stages, but I can see myself coming back to this one for a while. 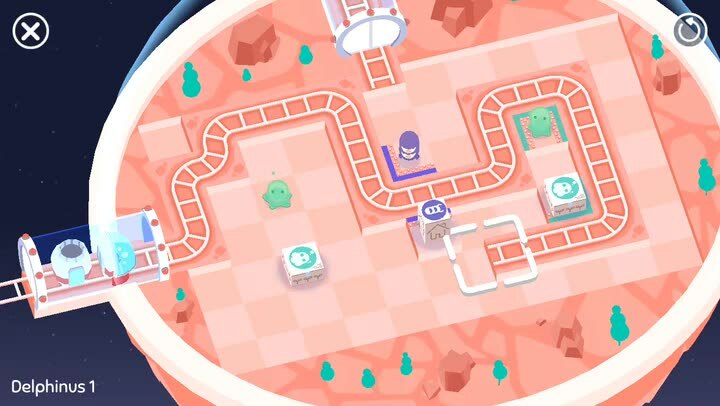 I highly recommend checking out Cosmic Express if you’re a train puzzle game fan. You can find Cosmic Express on the App Store as a universal download for your iPhone and iPad for just $4.99. There are no in-app purchases.